This is my first official fall craft...hopefully I'll have time for many more! 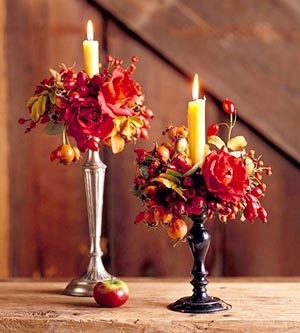 My mother-in-law fell in love with this picture of fall candle rings when she saw them on my blog here. She wanted to know where she could buy some, but I suggested we make them instead, especially since these candle rings are larger and fuller than other pre-made versions I've seen in stores. Plus, we can choose our own color scheme. My in-laws are actually coming to our place to visit this weekend, so we're going to have a little craft day (well, just the girls...the guys will be doing their own thing!). Before taking the plunge on these with my mother-in-law, I wanted to give them a test run to make sure my idea actually worked! I'm happy to report that it did...so here are the super easy instructions! 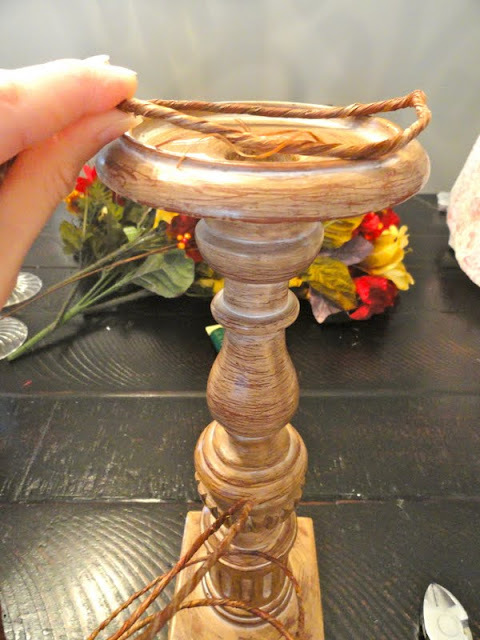 First, cut your twine to the same size as the candle holder you'll be putting it on and shape it into a ring. Then, snip off some of your flowers from the bunch, leaving only a short stem. Attach the flower to the twine ring by wrapping with floral wire. 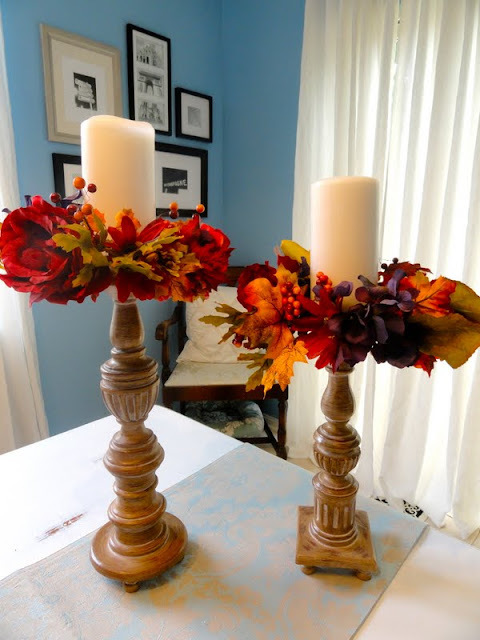 To hide the green wire and twine, just fill in with some smaller leaves and flowers. I used a hot glue gun for this part. It doesn't have to be filled in perfectly, just cover the most obvious spots. We'll be making more this weekend, so check back to see how those turn out! Have you done any fall craft projects yet? I'd love to hear about them! I'm linking to the Fall Festival over at The DIY Showoff!